Aberporth’s shops include a general food store, post office, chemist and gift shop. There are two cafes (in season), 2 pubs and several restaurants nearby including Chinese and Indian. The Nearby village of Tresaith also boasts beautiful scenery and a top class restaurant, the ‘Ship Inn’. The market town of Cardigan is 7 miles away and among the local attractions are the Teifi River, the Welsh Wildlife Centre, Cenarth Falls, Cardigan castle, boat trips and canoeing. Local wildlife includes Dolphins, Seals, Red Kites, Buzzards, and occasional Foxes and Badgers. The stunning Welsh Wildlife Centre stands within the Teifi Marshes Nature Reserve on the banks of the River Teifi. The building won an award for architectural design in 1993 when it was first constructed, and still astonishes the visiting public today. 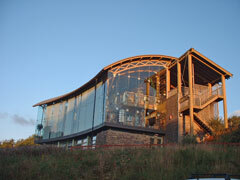 It is constructed largely of wood and glass and has panoramic views over the Teifi River, Cardigan town and woodland. Hosting a wide range of professional and amateur theatre, cinema, music and dance productions.